- Venezuela arrested two Chevron employees because of their unwillingness to participate in corruption. - International oil companies were the only reason Venezuela's oil production wasn't expected to plummet below 1 million b/d. - Now that risk is starting to increase. - In any event, even if Venezuela somehow magically keeps production flat, the global oil market deficit is -0.7 million b/d. If IOCs pullout, the deficit increases to -1.55 million b/d. 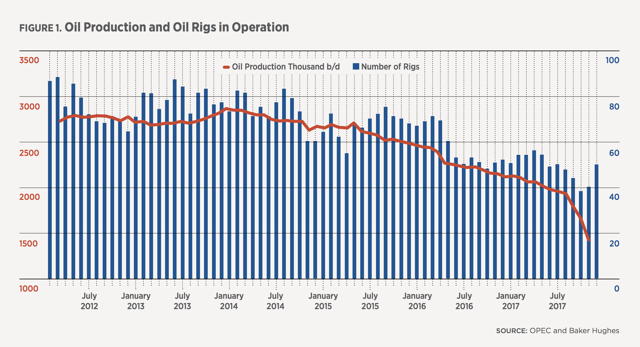 It is far more likely that investment remains at the current level or declines, production in PDVSA-operated fields continues to fall, and the joint-venture production stagnates or slowly declines. In this case, while production would continue falling for the next few years, it would probably not collapse. Rather, production would asymptotically reach a level (e.g., 1 to 1.2 million b/d) at which it would stagnate. This is expected because remaining production would be concentrated in newer fields, operated by joint ventures, and in the Orinoco extra-heavy Oil Belt-areas in which decline has been less pronounced. There is, of course, a risk of production collapsing much further than forecasted here, due to a combination of events such as an oil strike, a full-blown credit default, generalized international sanctions, or massive civil unrest, all possible occurrences. In the case of default and stringent sanctions, PDVSA would rely extensively on Chinese and Russian national oil companies, both for marketing the oil to limit the impact of sanctions and for operating the joint ventures. An intermediate, albeit unlikely, scenario to consider is one in which a shift within the government occurs, opening doors for limited economic reforms. Such a scenario would lead to stabilization in oil production levels at around 1.5 to 1.7 million b/d. This outlook would require that Western companies stay and slightly increase investment, in an environment of limited sanctions, debt restructuring, and some basic macroeconomic reforms, under a favorable oil price environment-a serendipitous confluence of preconditions that remains implausible. Limited natural-gas exports to Trinidad would also occur in this scenario. Finally, in a full-on successful transition scenario, Western companies would play a major role in the recovery of the Venezuelan oil sector, along with national oil companies from China, Russia, and India. As in most oil-exporting countries, PDVSA would likely continue to play a prominent role, but that would require a major restructuring of the company, refocusing it on commercial oil and gas ventures. As you can see in our highlighted section above from the article, the scenario of both stagnating production, stabilizing production, and recovery in production require none other than the help of Western companies. In the latest scandal, Venezuela charged two Chevron employees with treason for refusing to sign a parts contract for a joint venture with PDVSA. The two Chevron employees were jailed when they refused to sign a supply contract written by PDVSA executives under an emergency decree - which skips the competitive bidding process, according to a half-dozen sources close to the case. Such decrees have been cited by Venezuela prosecutors as a means of extracting bribes in some recent PDVSA corruption cases. The Chevron employees balked when the parts were listed at more than double their market price in a contract worth several million dollars, one of the sources told Reuters. The workers oversaw operations and procurement at Petropiar, an oil upgrading project co-owned by PDVSA and Chevron to transform Orinoco Belt's extra heavy crude into an exportable product. But with the arrest of Chevron's two employees, will this start the exodus of IOCs from Venezuela? If so, what are the dire consequences? Interestingly enough, Schlumberger (SLB) and Halliburton (HAL) have now both written off their remaining investments in Venezuela. SLB took a pre-tax write-down of $938 million in Q4 2017. HAL has now written off its remaining $312 million investment. SLB's CEO, Paal Kibsgaard, took it one step further in the latest earnings call and said Venezuela's oil production was in "free fall." The negativity surrounding the loss of hope from servicing operators to the latest arrest of its JV partner employees are only piling onto the dire situation we are seeing from Venezuela, but the significance of these two events cannot be dismissed so easily because IOCs are needed in order to keep Venezuela's oil production from free falling to nothingness. What happens if IOCs pullout and what happens to the global oil market balance? Here's how you should size up the situation with Venezuela. Current production ~1.5 million b/d. Natural decline possible to ~1.1 million b/d this year. JVs holding up production from falling below 1 million b/d. OPEC production in March 2018 was 31.83 million b/d. Call on OPEC increases to ~33 million b/d by end of 2018. If Venezuela's oil production falls to ~1.1 million b/d, that will decrease OPEC's production by another ~400k b/d to ~31.4 million b/d. That would require other members to increase production by ~1.6 million b/d by the end of 2018 to prevent more storage draws. If IOCs pullout, the support underneath Venezuela could get yanked resulting in a substantial loss in production. Our view would be a free fall to ~600k b/d to ~700k b/d or an additional loss of ~400k b/d to ~500k b/d. As you can see in the table above, even if Venezuela kept its production flat, which in our view is the best case, the global oil market deficit remains at -0.7 million b/d. And the deficit only increases from here on out, so oil bulls can view the demise of Venezuela's oil production as a sort of margin of safety or "free call option" to the upside. The situation in Venezuela is simply too little too late. No matter what Maduro does for the oil industry now, nothing will correct the steep production declines we are seeing. As the tensions grow with its IOC JV partners, we think the possibility of IOCs leaving is no longer a nonexistent risk factor. In the event that Chevron decides to exit Venezuela for fear of more government retaliatory tactics like this, oil production could fall through the pivotal 1 million b/d and the real death spiral begins. For the global oil market, whether Venezuela's oil production stabilizes or declines further won't change the fact that it's in a deficit and will continue to be in a deficit into next year. For oil bulls then, this scenario analysis is pure upside.